Lite Brite, makin' things with liiiiiight! What a sight, makin' things with Lite Brite? 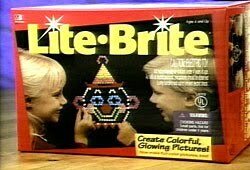 Who didn't love Lite Brite? But looking back, other than the fun, there are things we remember. Stepping on the pegs in the shag carpet in your bare feet -- OUCH! The weird pictures in the commercial -- a rooster? Bozo the clown? It's like the people designing the patterns had never left 1944 -- what do kids love? Roosters, right Bill? And clowns! The Wikipedia entry on Lite Brite is pretty brief, but it notes that the contraption came out in 1967 -- hey! Same year as me! It also notes that the (scary) clown and something called the Wizard of Light (a wizard with the Lite Brite name above him) are among the classic pictures. I did love this toy, and can't wait till Kelly is old enough that the pegs are no longer a choking hazard and we can buy one. And we have wood floors, so while the pegs will still pose a bare foot issue, at least they won't lie lurking in the depths of the shag carpet as they always did in my house.